Escape from the Planets of Apes is the second sequel to the original Planet of the Apes and its premise is to reverse the plot of of that movie. The IMDB gives the following synopsis"Cornelius and Zira, the simian ape couple from the first two ape films, flee from their doomed planet (after the events in Beneath...) in the same spaceship used by Taylor in the first film, and travel back through the same space/time porthole and land on late 20th Century Earth where they are received with fascination and fear from the people they meet." I describe it as thus: Apes crash to Earth! Apes are Persecuted! Apes have a baby! Apes must Escape the Planet of the Apes! Tragic ending! As has become expected by this time, the film makes good use of social commentary - the obvious is all there ape rights, equality for all. But it gets into the battle of the sexes, duplicitous scientists, abortion, forced sterilization and the question just about every sci fi movie about time travel struggles with - do humans have the right to alter their future? It even asks the classic question - if you could, would you go back in time and kill Adolf Hitler? Escape from the Planet of the Apes answers how the Earth got to the state it was in the first two ape movies. Cornelius described how a plague killed all the dogs and cats which lead to the enslavement of all the apes as pets who eventually revolted against man. 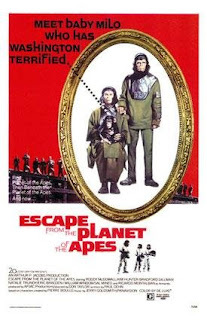 Overall, Escape from the Planet of the Apes is not as thrilling as the first two movies, suffering from third-movie-itus however it has it's moments and is a fun Sunday afternoon DVD.